A very atmospheric photograph of Venice at dusk, taken from St Mark's Square, with views across to the Basilica and Campanile. We can see the very ornate Doge's Palace, and the famous statue of The winged Lion of Venice. The limited colour palette and muted tones offer plenty of challenges for puzzle fans. Our puzzles are a perfect way to relax after a long day or for family fun on a rainy day. 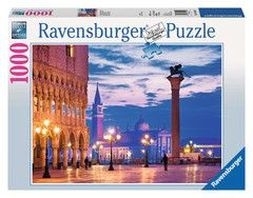 The superiority of a Ravensburger puzzle is renowned. Be one of the millions to experience a whole new world of puzzling fun with Ravensburger quality products. Every one of our pieces is unique and fully interlocking. The quality is enhanced by the vast array of shapes made by our handcrafted tools - one of the many ways that Ravensburger shows its passion for excellence.